This could be an issue of bound steering column because the front wheels are turned at an angle against curb. Therefore you need to jiggle the steering wheel back and forth. 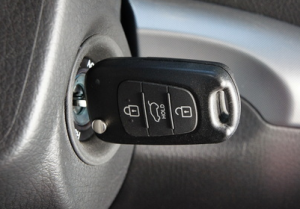 A worn out or wrong key would also prevent the ignition switch from turning. Try a spare key on the ignition switch to determine whether it is an issue of bad key or bad ignition switch. If it is a bad key, use the spare one to sort the problem out. If the problem is with the ignition switch, then lubricating it with nonconductive lubricant could help. 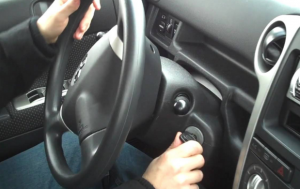 When you turn the ignition switch to the start position and nothing happens, a bad ignition switch could be the problem or rather a faulty starting circuit. Check whether instrument panel warning lights come out when the key is turned to the ON position. If there are no lights, then the issue could be a dead battery, loose or corroded battery cables. If headlights work with key turned to the ON position, then it is not a battery problem but rather an ignition switch problem. It could be faulty switch circuit wiring or fusing or an issue with the starting circuit (solenoid, wiring, bad relay or starter). Possible causes of this could be an anti-theft fault, faulty fuel pump circuit, engine computer or ignition circuit. 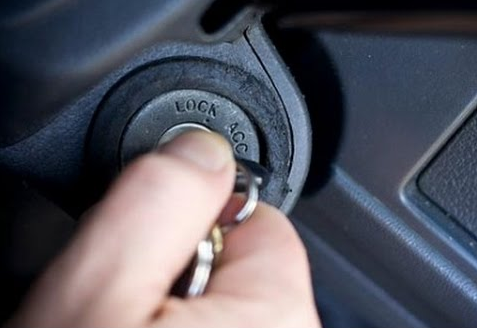 If anti-theft light flashes, the problem is that the computer doesn’t recognize the key or key fob and this stops the engine from starting. A bad receiver in the switch ignition, damaged key fob or smart key or faulty wiring between the engine computer and switch may be the problem. If the engine cranks but anti-theft lights don’t flash, the computer recognizes the key but the engine fails to start because it doesn’t get spark or fuel. Check fuel gauge to confirm you have fuel. If you have fuel, does it buzz when the key is turned on? If it doesn’t buzz, the problem is faulty fuel pump, pump wiring or relay. The problem could also be ignition control computer or module, or bad crankshaft position sensor in the ignition system. If engine cranks much slower than expected, check for a bad starter or cable and battery connections as this is not a bad ignition switch symptom. This could be a sign of a worn out ignition switch. Worn out contacts inside the switch may result to temporarily voltage loss due to vibration or heat. 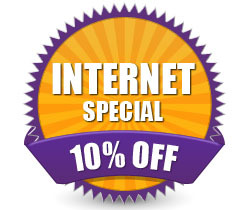 This then causes the engine to stumble or die when driving. Ignition switch wears out from usual use. The more you use the ignition switch, the more the electrical contacts inside the switch get corroded or worn out. Also, a heavy key ring may place additional stress on to the switch. When driving, it may sway and cause rapid twists on the switch- hence cause it to fail eventually. Get Your Ignition Repaired in Burbank, California Today! Bound steering column lock may be the problem here. Jiggle the steering wheel back and forth until it “clicks” into a locked position for you to remove the key. If it still doesn’t come out, then faulty column locking mechanism is the problem. Also, stuck pins inside the key lock cylinder could be the issue. Finding a lock smith to remove the broken key from the ignition switch is the best option. After it has been removed, a spark key or new key made from an old damaged one may be used to start off your engine. If you can’t have these options, you will need to acquire new keys and a lock cylinder altogether. Copyright 2015 © www.burbanklocksmith.org. All rights reserved.